What is the difference between a regular home and a custom home? The difference between a regular home and a custom home is the number of choices, the quality of materials and the level of details. Regular homes may offer three choices of average quality stone for a kitchen counter whereas every option is available in a custom home. The small details that provide character, charm, and uniqueness are also typically lacking from standard homes. They might offer crown molding but that same style will be in every home built. Custom homes allow for just that- customization. No request or idea is off limits. Wine cellars, secret passageways, and personalized pet stations are all possible with custom homes. This is probably the most frequent question custom home builders get asked, it’s also the hardest to answer. Check out our post on how much it costs to build a custom home to get a general idea. It’s important to keep in mind though that cost is dependent on a number of factors from timeline, materials and square footage. There’s no easy answer to this question but feel free to contact us to discuss prices and set up a budget if you’re interested in building a custom home. What is the best area to buy land and build on? The answer to this is all dependent on what you want out of a house. Lot size, proximity to shops, school districts, highway accessibility and neighborhood growth are all things that can influence this decision. We can discuss all of these factors with you before you go ahead and decide where to buy and build. Another hard question to answer. It takes around a year and a half to two years to complete a custom home. You can read a breakdown of this timeline here. This timeline includes design, planning, permitting and construction. The size of the home greatly impacts how long a build takes. During any construction and build, outside factors can influence a timeline such as weather and materials delays. We will work hard to compensate if any of these issues arise. How big of a home can I build on my lot? The size of home you can build on your lot is all determined according to local bylaws. Sina Architectural Designs will take care of looking into which laws impact your specific region, so you don’t need to worry about that. Most bylaws state that your property cannot cover more than 27-35% of your total lot size. We can help you determine the max square footage you can get and together we can decide which layout will work best to maximize the space. Can I visit the job site while my home is being built? Of course, you can! We want you to participate every step of the way and construction is one of the longest and biggest steps of the whole building process. We encourage our clients to visit the site so that you can not only see the progress but also to point out any changes you might want before it’s too late. Just be sure to contact us to arrange a visit before stopping by, as construction sites can be dangerous without precaution and supervision. What are your firm’s experience and qualifications? 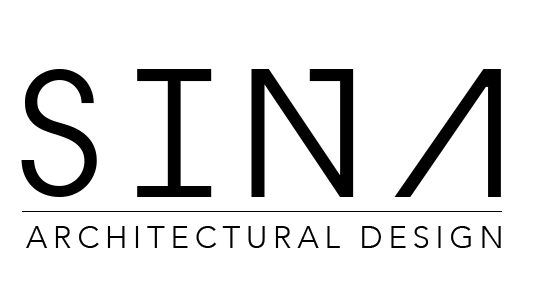 Every staff member at Sina Architectural Design has degrees and certificates in their field as well as years of experience. We only hire the best because we only offer the best. Check out our portfolio to see our past work and feel free to contact us to get more information about us. There are four main steps we take to make the designing and building of your custom home as smooth as possible. Pre-Building: We’ll discuss your needs and wants, and establish your budget. This stage is also when we get to know you, your personality, hobbies, style and more. All of this helps us create the best architectural design for you. Design, Schedule, and Budget: Once we’ve gotten to know what you want out of a home we’ll create a design for your approval. After a design has been approved, a more finalized budget and timeline can be generated. Site Analysis: We perform meticulous site analysis so that we have the most accurate idea of what your lot has to offer. This includes soil analysis, permitting and zoning. During this stage, we also consider things such as pollution, lighting, noise, and privacy of your home. Construction: Once both you and the zoning offices approve plans, work gets underway. During this stage, we’ll consult with you on material selections and specializations, and get down to the details. Living: After construction is complete you get to sit back and enjoy your beautiful new custom home! Ready to Build Your Toronto Custom Home?